As a girl boss, I'm constantly on the go. One minute I'm at my desk and the next, I'm racing out of the door for a new client consultation, headed to snap photos for my latest writing piece, or refreshing in the car before happy hour with blog friends. Don't get me wrong, I am definitely not complaining, and that's mostly because I've mastered a few things that make being on the go easier for me. For one, I keep a stack of business cards in every single bag I own. Literally. There's a stack in my date night clutch, a stack in my tote bag, a stack in my wallet; there's even a stack in my airport carry-on. Being prepared with business cards is one trick that I've finally mastered, but I've just recently added a small preparedness kit for my car. No, I'm not talking about blankets, water bottles, and granola bars in case of a highway emergency. 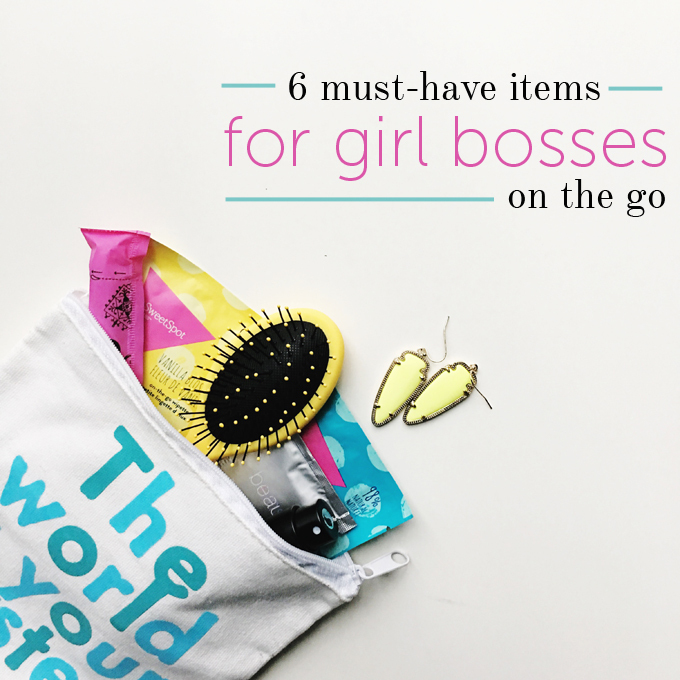 I'm talking about having a bag of girl boss necessities; a bag that is filled with things to keep girl bosses refreshed and looking and feeling their best. And I keep my bag in the console of my car at all times. 1. Hairbrush - Do yourself a favor and pick up a travel hairbrush. Nothing kills a stellar business meeting quicker than making a bad impression with bad hair, amiright? 2. SweetSpot Labs On-the-Go Wipes - All the girl bosses I know take their gym time just as seriously as their meetings and happy hours, but showering between barre classes and bar drinks just doesn't always happen. Available at Target, these SweetSpot Labs On-the-Go wipes were made for women on the go. Created with 98% natural ingredients, these wipettes are clinically tested and gynecologist recommended. Plus SweetSpots Labs is a company by women, for women which makes me love them even more. (P.S. I also scooped up their Vanilla Blossom gentle wash at Target). 3. RMS Beauty Makeup Removers - Keep these coconut oil wipes in your bag for quick makeup fixes. If you're really on the go, you can even clean off your entire daytime makeup and start fresh with a swipe of these wipes. 4. U by Kotex Click Tampons - Don't get stuck at on the go without a tampon. These U by Kotex tampons are smaller than most tampons and can fit discretely in your clutch. No need for an extra large bag for feminine necessities; simply slip this tiny tampon into your bag. And don't worry, the smaller size doesn't mean less absorbency. 5. Perfume - A quick mist of perfume can do wonders for your confidence. I keep my Scentbird perfume in my bag at all times. 6. Spare Pair of Earrings - Grab a pair of statement earrings that are conversation starters and add them to your emergency bag, too. You'll feel better swapping out your studs, and you'll be amazed at what this quick switcheroo will do for your outfit. Going with the flow is key when jumping from meetings to events, and having a few necessities that help you refresh with ease is something you'll want to add to your car, too. Pick up several of the items above at Target. Right now, you can buy any U by Kotex and any SweetSpot Labs product and get a deluxe sample for free. Plus, you can get 15% off with the Cartwheel app. Sounds like the perfect start to a girl boss bag to me. Love how simple and colorful this post was! 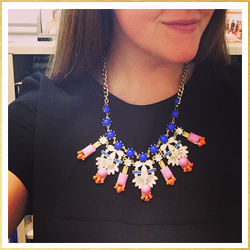 Being a girl boss is awesome!